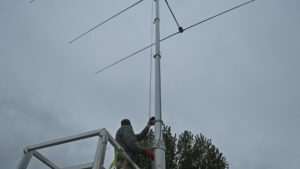 The goal of this page is to provide enough information so that any group of members can load and then deploy the Pneumatic Antenna Trailer without needing a key person that has all of the tricky parts lists, information, tips and tricks in his head. 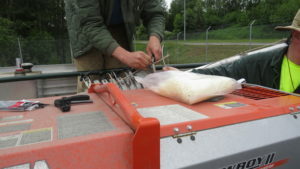 Keys – For the storage lockers, the air pump locker on the deck of the trailer, 3 padlocks on the electric panels, the generator, and the spare tire. 08 – Chock the trailer whenever it is parked. There are four storage lockers, two on each side, under the flat bed of the trailer. The trailer has an 10 KVA Kubota generator. The power distribution panel is just to the left of the ramp. There are two ramps that are stored on their sides towards the back of the trailer. Under the tower you can see a red power cable reel. The power cable itself is light blue. 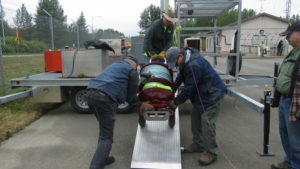 09 – Here you can see that we have removed the ramp from the side of the trailer and put it on the side to unload the power cable reel. 10 – Rear view of the the trailer with the top portion of the mast installed. At this point, we have removed the canvas weather cover from the mast and have slid the top of the mast with the large hinge over the foot long stub that goes through the square mounting plate. The top of the mast is in the back left corner of the garage. The ramps are still stored on the sides of the flat bed. The large red box is the Kubota generator, and the large box on the right is the 90 gallon fuel tank. 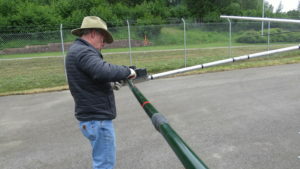 The antenna boom is 16 feet long and the elements are about 18 feet long, so we need about 18 feet wide by 25 feet long in back of the trailer to get the antenna assembled. 13 – At the top of the pneumatic mast is a square plate where a rotator or other items can be mounted. Above that is a fitting with a large green hinge. The SteppIR Yagi antenna attaches to the large green hinge. 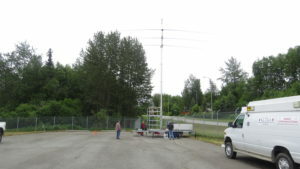 As the antenna is assembled, it is horizontal to the ground and the mast is angled. 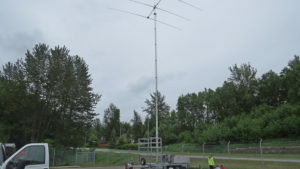 As the mast is raised to the vertical position, the hinge allows the antenna to remain horizontal to the ground as the mast changes it’s angle to the ground. 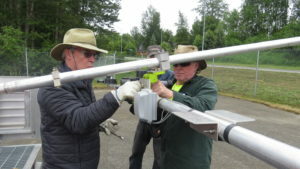 15 – After the top section of the mast is installed into the top of the pneumatic mast, the next step is to attach the antenna boom to the mast. 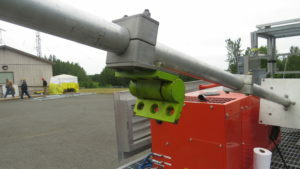 The mounting plate goes up and the control connector box faces the trailer. Once the first bolt is inserted and hand tightened into the middle hole of the hinge, the boom will balance and it will be easy to insert the other two bolts. After all of the bolts are in, tighten them all. 16 – The entire SteppIR Yagi antenna weighs a bit over fifty pounds, so each of the antenna elements are fairly light. 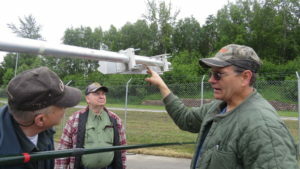 Attach the first two antenna elements to the opposite sides and ends of the boom. They will balance each other out. You take the rubber cap off of the motorized control box and take the plug out of the end of the antenna element. Slide the antenna element into the control box until it bottoms out. Put the rubber cap from the motorized control box and the plug from the antenna element into a baggie to be stored in one of the trailer lockers. 17 – This is one of the motorized control boxes for the SteppIR Yagi antenna. The metal elements of the antenna work like a metal measuring tape. When you tune the antenna, a motor in the box extends or retracts a metal tape inside the fiberglass tubes. Some of the elements have a gray spacer, and some don’t. 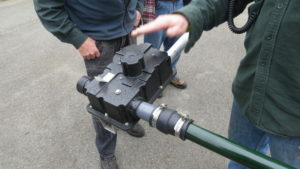 18 – Once the antenna element is bottomed out inside the control box, You can twist the antenna element and or rubber sleeve and or the hose clamp around to make it easier to get the nutdriver on the hose clamp. Slide the rubber sleeve up toward the control box and tighten the clamps with the nutdriver. Some of the elements have a gray spacer, and some don’t. 19 – Attach the next two antenna elements opposite to the first two. Attach the fifth antenna element opposite the trailer. Temporarily plug in the sixth element that goes over the middle of the trailer. It is temporary at this time to balance the antenna. The middle antenna element over the trailer sticks through the framework for the crow’s nest, and will not clear it. The tower needs to be raised a bit before the last element is firmly attached. 24 – Some time in here, put the sides up on the crow’s nest. 25 – At Field Day in 2017 we attached a 120 degree Mesh Network antenna to the very top of the mast. Put the rubber cap from the motorized control box and the plug from the antenna element into a baggie to be stored in one of the trailer lockers. The heavy string (florescent pink) for steering the antenna can be attached to the ends of the boom. 28 – For the SteppIR Yagi antenna, we need an antenna cable and an antenna control cable. The antenna cable needs to be connected, electric tape to waterproof it and wire tie the cable to the mast. 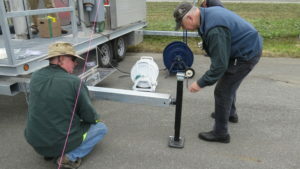 29 – This is the cable reel for the SteppIR Yagi antenna. 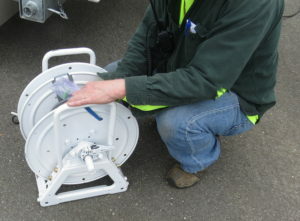 There should be a plastic bag weatherproofing the connector when it is on the reel. 31 – Open the box on the boom and plug in the control cable. There is a cable tie on the cable that acts as a strain relief in side the box. Make sure that the cable tie is within the box. Close and latch the box and wire tie the cable. 33 – All the cables and steering strings are connected. 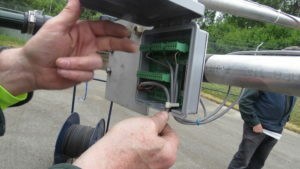 The antenna connector has been waterproofed with electic tape. 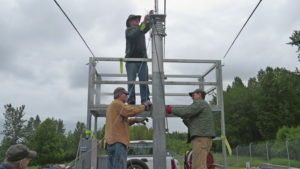 The antenna cable, antenna control cable, and mesh network cable have been wire tied to the mast, and around the square mounting plate at the top of the tower. The antenna element that is over the trailer and under the crow’s nest is has not been tightened down. 36 – Here we are routing the cables through the cable management rings on the mast. 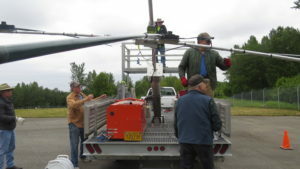 38 – At this point, have a couple of people support the outer ends of the antenna and you can unplug the middle antenna element that is over the trailer. 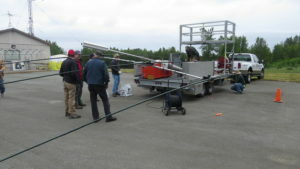 Now you can raise the mast until the boom is about five or six feet over the trailer bed. 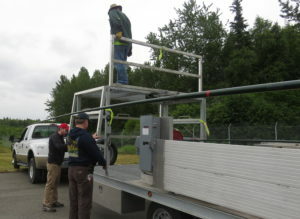 Some one standing on the trailer bed can take the last antenna element, make sure that it is over the crow’s nest on the trailer, and install it and tighten the hose clamps on the rubber sleeve. 39 – Now the mast can be raised to vertical. Keep an eye on the antenna cable, control cable, ethernet cable and the steering strings. 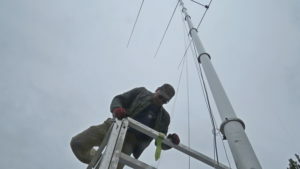 At this point the mast has been angled to the vertical position, the antenna(s) are assembled and attached to the mast. All cables and steering strings are connected. The mast and trailer were not leveled yet because we were going to move the trailer to within about 3 feet of the chain link fence. 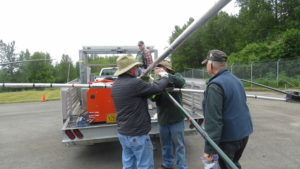 The antenna boom is 16 feet long and the elements are about 18 feet long, so we need about 18 feet wide by 25 feet long in back of the trailer to get the antenna assembled. 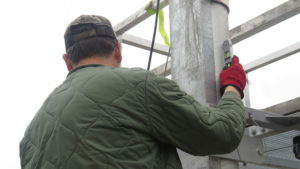 42 – Double checking cable routing around the square mounting plate at the top of the tower. There is an eyebolt on one of the mast segments that we used to support a dipole. A pulley was attached to the eyebolt. The curly un-terminated multi-wire cable you see is part of the mast. It isn’t being used as of June 2017. 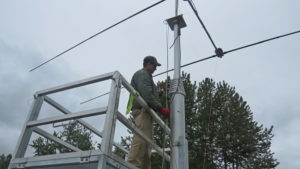 43 – The cables need to be wire tied to the mast above the square horizontal plate. They also need to be routed around the square horizontal plate, and can be wire tied to the corners of the plate. The cables need to be fed through the cable management loops attached to the ring on each segment of the mast. 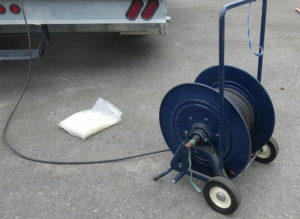 This is a good time to make sure the cable reels are located on the side of the trailer where you really want them. 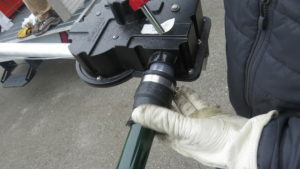 44 – Once the trailer is in it’s final position, you can use the hand crank jack located just behind the trailer hitch to raise the trailer off the ball to disconnect the trailer from the truck. Now we can level the mast and trailer. 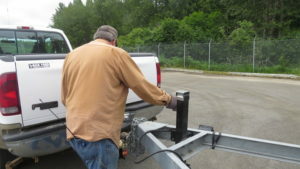 45 – We extended the trailer’s outriggers and attached the jacks to them. We cranked down the jacks on the front two outriggers until they started to have tension on them. You can watch the top of the outrigger as it starts to touch the top of the tube at the trailer. 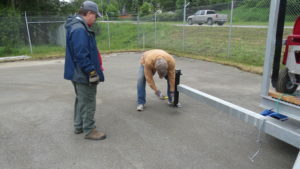 47 – We adjusted the leveling of the trailer from side to side. We then lowered the rear jacks so that the outriggers were taking weight. We then adjusted the front and back sets of jacks in tandem (OK, 5 turns on both of the front jacks) to get the mast vertical front to back. In the back of the trailer, on the left side, there is a lanyard with a remote control like you use to control an overhead winch. The cord is black and the control head is yellow. It has four rubberized bumpers and one switch marked “Up” and “Down”. Push the switch towards up, and somewhere in the bowels of the trailer, air is pumped into the mast and the mast will start to extend. 49 – Each mast segment has a ring at the top. Attached to the ring is a cable management loop, maybe an eyebolt and a 3 pointed knob. If you tighten the knob, it will clamp the ring to the inner section of the mast. If all the sections are clamped down and the mast looses air, the mast will stay up. The clamps are not to be used as brakes to lower the mast. 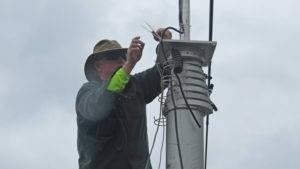 As the mast is going up, there should be one person in the crow’s nest to tighten the clamp knobs on each segment and to make sure that the cables are in the cable management loops as the mast goes up. 50 – The mast does not extend at an even fixed rate. The mast is full of air, the cables and antenna are waving in the wind. The exact amout of friction varies from inch to inch, so the mast extends smoothly, but it’s not like we have a rack and pinion driving the mast up at an exact rate of inches per second. On the ground, someone needs to be watching each cable reel and the steering strings. 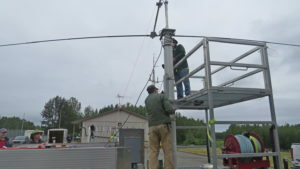 51 – Once you hear the last segment clunk into the up position, release the “up” switch, tighten the clamp on the bottom mast ring, check your cables and tie down the steering strings. 55 – Here you can see the antenna, conrol and mesh network cables going through the cable management rings. To the right is the florescent pink steering string. 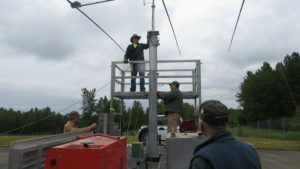 The other two sets of cords are used to raise a dipole on this mast. 56 – The tower, ready for action. The A frame at the front of the trailer is about 6 feet long, so the total trailer length is about 22′. The trailer is less than 8 feet high. We have a Kubota GL 1100 generator that will put out 10.0 KVA. It only has about 4 hours on it. The mast is about 5 feet from the front of the trailer. Dual axles, tire pressure of 80 PSI. This is the second version of the AARC Pneumatic Antenna Trailer Setup page as of July 26, 2017. 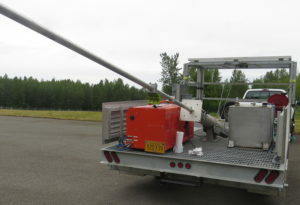 Is the “AARC Pneumatic Antenna Trailer” a good name? Trailer ball size? Which AARC vehicle(s) are recommened to tow the trailer? Procedure for locking the mast in the vertical position. Is there a master switch to power the switches to tilt and extend the mast? Is there a written inventory of what is in the lockers of the trailer? What needs to be loaded on the bed of the trailer before it leaves the club house?